FDM is back with their Back To Business Programme starting training in March 2017. Have you taken a career break? Are you looking to step back into a successful and rewarding career? The FDM Getting Back to Business Program includes immersive industry training followed by a minimum of two years working on-site with one or more of FDM’s prestigious clients. The program is ideally suited for experienced professionals who are looking to return to work following a career break. 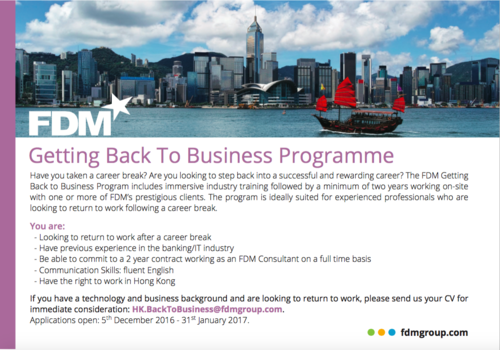 If you have a technology and business background and are looking to return to work, please send us your CV for immediate consideration: HK.BackToBusiness@fdmgroup.com. Applications open: 5th December 2016 - 31st January 2017.